On his April 5th and April 6th Writer’s Almanac, Garrison Keillor featured two poems from Jackie’s latest book. Hear him read “Teaching My Husband to Swim” and “Why I’m Here”. Reading The Gift That Arrives Broken, I kept asking myself: what is the magic that makes these poems of a quiet, ordinary life, with small sensuous pleasures, and the tracking of a father’s gradual decline toward death, so compelling? Is it the understated wisdom, the graceful compassion toward the self and others…? Is it the precision of description, is it the amused memories of the self at sixteen, dropping acid and tearing up money, or the amused speculation about a girl with a baby at a crafts fair selling goddess magnets…? This is an art that is centered everywhere. It brought me closer to my own center, and it will bring you, whoever you are, closer too. Jacqueline’s Berger’s poems manage to be focused on the private world of friends and family while being spacious at the same time, in part because her focus is one of the subjects of the poems. Standing close she can be true to the feelings of the moment. Standing back she can place those feelings in the context of large questions about loneliness and connection, meaning and accident, that give the poems range and resonance. Her voice is intense without being solemn, and the tight muscular lines propel the poems briskly forward, ensuring her honesty about limitation never becomes merely elegiac and concessive. The Gift That Arrives Broken is a wise and moving book. In her third book Jacqueline Berger surveys the terrain of mid-life, keeping her own youth clearly in view along with the decline of her aging parents. 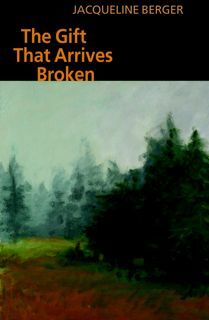 Her perceptions about the hungers of body and mind, striking in their candor, are couched in language that honors and deepens the losses, even as it uncovers the gifts to be found in brokenness. “Look at anything / long enough to love it,” she writes; her steady gaze is keen and loving. This entry was posted Wednesday, April 6th, 2011 at 9:46 am	and is filed under books. You can leave a response, or trackback from your own site.